Craft beer doesn’t have to be all serious. If you are ready from a break from mouthfeel descriptors and hop varieties here is some craft beer fun and games. 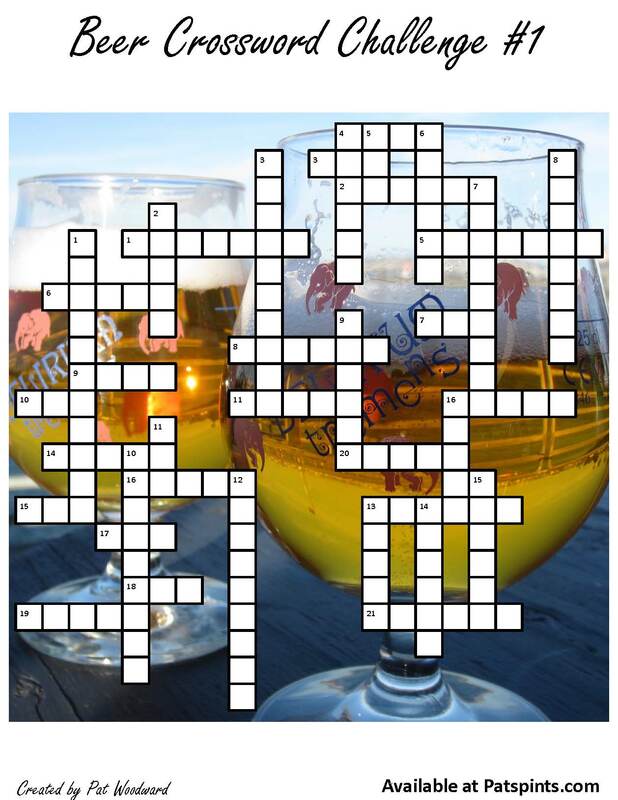 This is the first in a series of crossword puzzles (almost) all about craft beer. The puzzle and clues are shown below, but for convenience you may want to use the links in the post to download pdf files of the puzzle and the clues, then print it out at home. Once you’re done you can download the solutions and check your answers. Have fun and let me know what you think. Popular American variety of hops. Developed at Oregon State University and grown in the Pacific Northwest. An Indian dish made from split lentil beans (or peas), onions, tomatoes, curry and other spices. A well-known brand of English beer made in Burton upon Trent. A relatively light beer style first made in the Czech city of Plzen. A gargoyle is the unofficial mascot of this large San Diego craft brewery. Dutch word for white, and the first three letters in a style of beer resurrected by Pierre Celis in his hometown of Hoegaarden. Style of beer commonly referred to as a Belgian Farmhouse Ale. Great Lakes Brewery seasonal imperial IPA, Lake _______ Monster. Acronym for the low cost beer from Milwaukee now popular with hipsters. Micro-organism responsible for fermenting beer. Beer style most closely associated with Guinness, Irish dry _______. The largest of the Trappist breweries. Craft brewery located in Kalamazoo, MI. English beer style, ______ brown ale. A beer brewed in a monastic brewery that is not one of the official Trappist breweries is called an ____________ ale. Style of beer originally brewed with higher hop content to keep from spoiling over the long sea voyage from England to India. Type of grain used in a Weiss beer. Large American craft brewery located in Newport, OR. Native American tribe whose lands are located in Western New York. Beer festival celebrated every fall in Munich. A beer made with a bottom fermenting yeast at 34-36 °F. Grain traditionally used in the making of beer. A beer made with top fermenting yeast at 50-75 °F. Jamaican beer, Red ___________ . A dark beer made with unfermentable lactose sugar. A term that originally applied to stouts that were brewed for export to Russia, and has come to be used to signify any style that is higher in alcohol (and usually flavors). A style of dark beer dating from 18thcentury London whose name is derived from the transportation workers who known to favor this type of beer. Brewery located in Petaluma, California. A style of English bitter that is more hopped with higher alcohol content than the standard bitter. America’s oldest continually operating brewery. Large brewery located in Golden, Colorado. Maker of Blue Moon Belgian White. Chicago area brewery, Goose __________ . An ale that is spontaneously fermented with airborne yeasts indigenous to the Senne Valley of Belgium. American style lager, first brewed in California in the 19th Brewed at higher temperatures than most lagers. The name has been trademarked by Anchor Brewing.